Dessert makers had long experimented with a variety of ice cream flavors and styles. In the 1970s, frozen yogurt's entry into the dessert market was a distinct failure—consumers complained that it tasted too much like yogurt. Despite the initial reaction, manufacturers reformulated and refined their frozen yogurt recipes, and the increasingly health-conscious populace of the 1980s finally took to the low-calorie dessert with a vengeance. Frozen yogurt was soon available in a variety of flavors throughout the U.S. It proved to be just as versatile as ice cream, served in cones and cups, with toppings, on crepes, waffles, and banana splits. Frozen yogurt offered a tangier flavor than ice cream and more depth in flavor and texture than sherbet. "Milk solids, not fat" (MSNF) makes up between 8-14% of frozen yogurt. MSNF must be balanced in inverse proportion to fat for the best body of the product. MSNF consists of about 55% milk sugar, or lactose, 37% protein, and the remaining 8% are various minerals. The protein element increases the smoothness, viscosity, and compactness of the frozen dessert and makes it more resistant to melting. The future bodes well for frozen yogurt as it expands into new markets with new variations. People's interest in low-fat foods seems unabated and will, no doubt, continue to encourage the food industry to provide low-fat, tasty food. Technology will also continue to improve efficiency in manufacturing frozen yogurt as well the quality of the product. Arbuckle, Wendell Sherwood. Ice Cream. 4th ed. AVI Publishing, 1986. Dexheimer, Ellen. "On The Fat Track…Dairy Processors Race to Develop Better Low Fat Dairy Products." 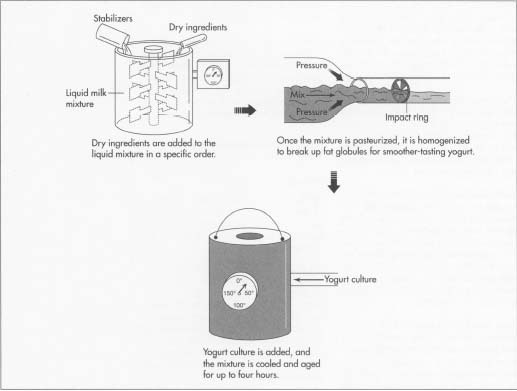 Dairy Foods Magazine, May 1992, p. 38. Mason-Draffen, Carrie. "The Very Fat Facts." Newsday, November 22, 1994, p. 13. Rogers, Paul. "Dairy Experts Forecast the Issues Most Likely to Influence the Industry's Course This Year." Dairy Foods Magazine, January 1989, p. 13. Well DOne Yoplait! I need to know the maker of the machine, from where to get the ingredients, stainless durable machine that can make frozen yogurt trouble-free. From low bugdet to high budget. I am trying to find out if "whey" exists in frozen yogurt or if it added in during the process? I need to know the maker of the machine, from where to get the ingredients, stainless durable machine that can make frozen yogurt trouble-free. From low bugdet to high budget.